Dining Out: Suzana | Pop.Bop.Shop. On our Israel trip, it seemed that with each restaurant we went to, my family would describe their dishes as "the best XYZ I've ever had!" Truly, each time we went somewhere it was even better than the place before. 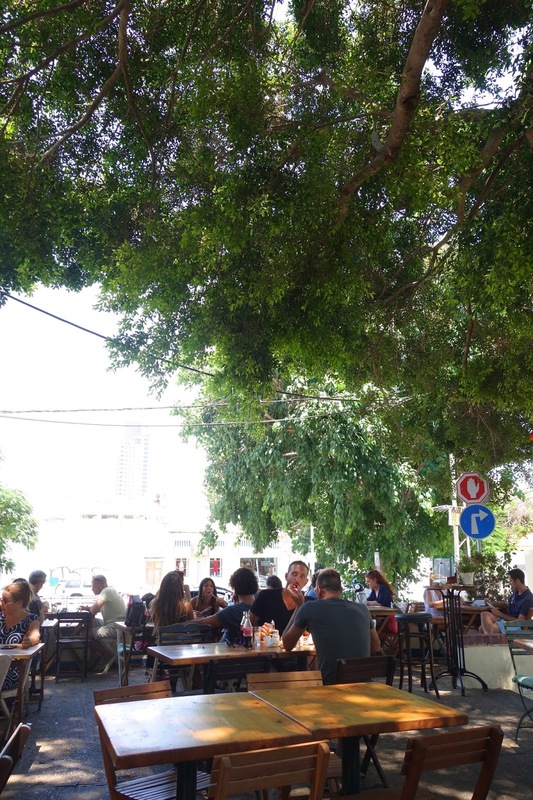 That trend continued at an outdoor cafe called Suzana in a neighborhood of Tel Aviv called Neve Tzedek. I love Neve Tzedek (and not just because my cousin lives there). It feels like the quiet, tree-lined neighborhoods in Europe where you explore narrow, cobble stone streets, never knowing what hidden gems you'll find as you turn the next corner. Suzana is on Shabazi Street, the main drag in Neve Tzedek. They are an extremely popular lunch spot because their whole patio is beneath the shade of lush, green trees. The day we went the temperature was hovering between 85 - 90 degrees and we were ready for some ice cold beverages. We were seated at a table in the shade with a great people watching view. 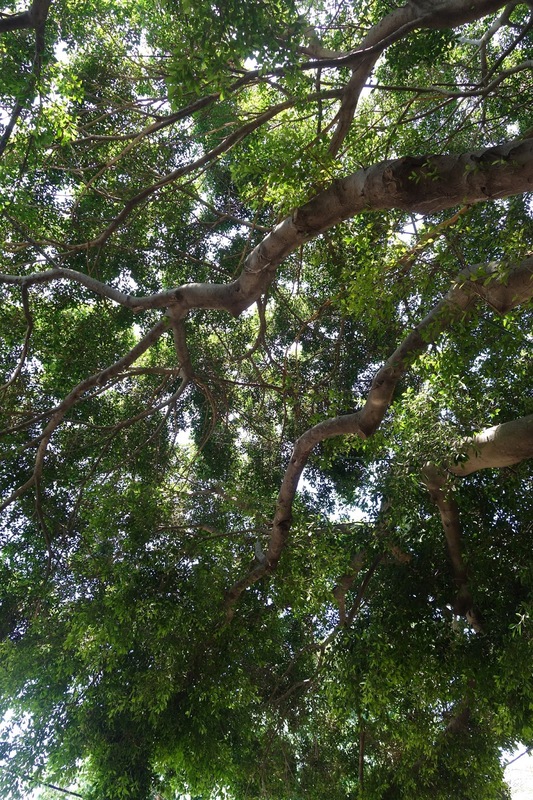 When I looked up from my seat, my eyes were treated to a beautiful combination of sun, green leaves and chirping birds. Thankfully, Suzana had version of their menu in English so we didn't have to struggle and guess what our options were. Despite 13 years of Hebrew school as a child, I have retained next to nothing. Sorry, Mom and Dad. 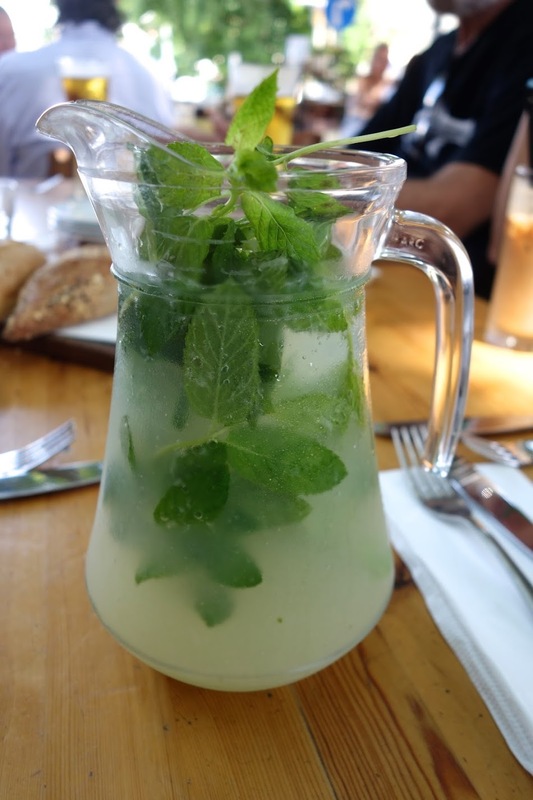 We began with a pitcher of lemonade, packed with fresh with mint. If you haven't noticed from my previous posts, Israelis love their mint! Despite the generous number of mint leaves in the pitcher, the lemonade itself didn't actually taste like mint at all. My mother and sister each ordered ice coffees. 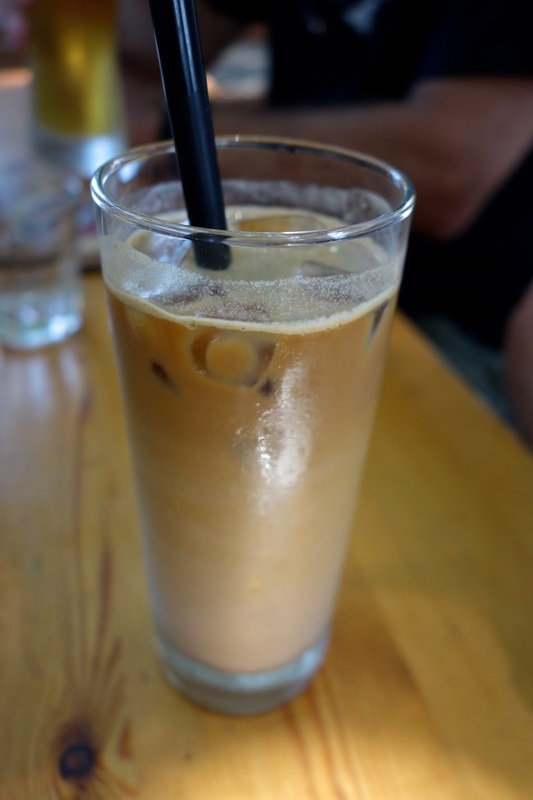 They both became addicted to this drink and I think if they had to sum up our week and a half in one sentence it would be, "The wedding was amazing and we really loved the Israeli ice coffee." Their eyes rolled into the back of their heads with their first sips. My sister said, "It's so rich and decadent that it almost tastes like a dessert." My mom even ordered a second glass! While we were perusing the menu, our waiter brought us two loaves of bread - one white and one multigrain. The bread was so fresh. It had a nice firm crust, but a soft, chewy, doughy center. To start, my dad ordered the eggplant and tehina. Those who have been reading this blog a long time know that my dad is a man of very few words (especially when it comes to describing food), but he couldn't stop talking about this dish. He said, "I could lick this plate. This is the most tender grilled eggplant I have ever tasted. It has such a silky, smooth texture. The pairing of the eggplant, tehina and lemon was superb." At our end of the table, the girls were sharing the leek and potato latkes. We were expecting a shredded vegetable texture, like you would get with a Hanukah potato latke, but these were more like patties. They had a crispy outer shell and were excellent dunked in the cold sour cream. For lunch, my mom actually ordered the traditional Israeli breakfast. First they brought her an Israeli salad (tomatoes, red onions, cucumber) which came with sides of feta cheese, labane cheese and sour cream. Next she received scrambled eggs with home fries. She called this plate, "simple," which you can see it clearly was. My sister ordered the green salad with grilled chicken, which she raved was, "the best grilled chicken I've ever had." See, I told you they kept saying that! She went on to say, "This lettuce tastes farm fresh. The tomatoes are ripe and juicy, the roasted peppers are velvety and the pine nuts add a nice crunch." I also went with a salad - the Greek. It was an enormous portion topped with tomatoes, red onions and a boat load of feta! For me, it was overdressed, but still yummy. 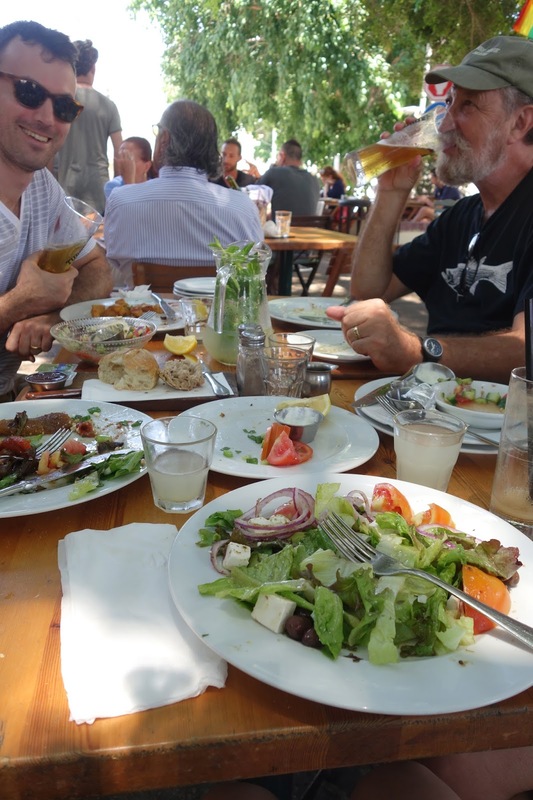 Down at the boys' end of the table, my brother-in-law was about to dig into a big plate of schnitzel. Quick side bar, when my sister was in kindergarten, her class was putting together a class cookbook full of everyone's favorite recipes. Five year old Emma asked my dad to include his recipe for schnitzel as her recipe. Clearly she married the right person! My brother-in-law described the schnitzel as "crispy with a batter that was just a little sweet." He also mentioned that the house made ketchup was a solid addition. 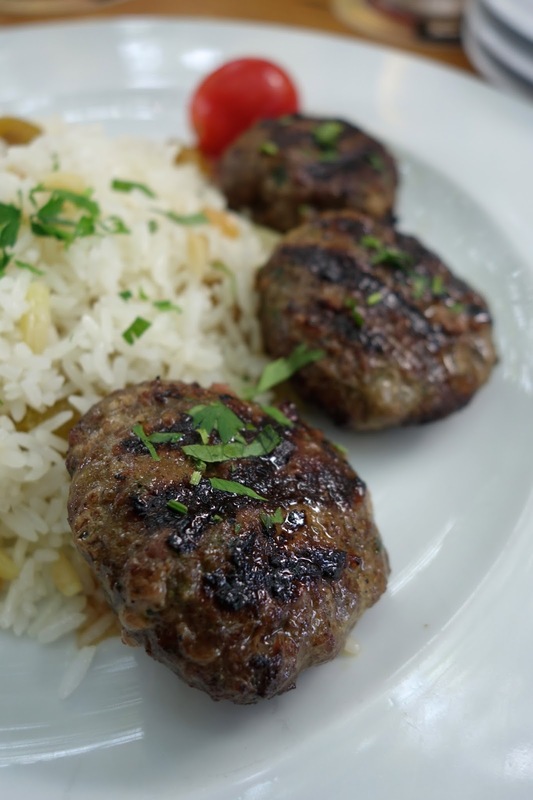 Though my dad was having a hard time imagining eating anything else after that heavenly grilled eggplant, he did place an order for lamb meatballs. The dish was ground lamb served with jasmine rice, garnished with almonds and grapes. As you can see, we were having quite the feast! I would also like to add that most outdoor restaurants in Tel Aviv are plagued by stray cats under and in between all the tables. They are constantly begging for food. I did not see one cat on the Suzana patio. A miracle! 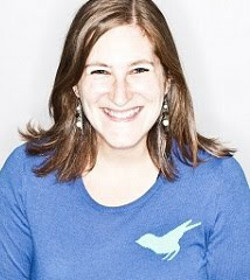 Visit Suzana at 9 Shabazi Street in Neve Tzedek. can i come on your next family trip? You sure can! As you can see, we love to eat. Good morning! It's an absolutely gorgeous day here in Boston today. Finally, some sun! 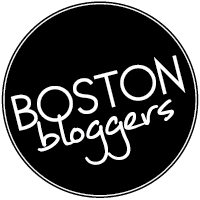 I am going to spend the morning at my favorite spring time event, the South End Garden Tour. Stay tuned for a photo-filled recap later this weekend. 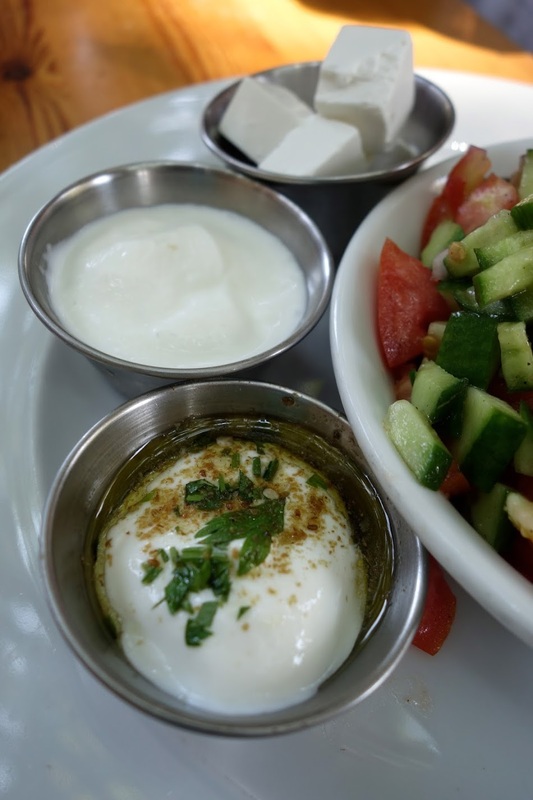 Today I want to tell you about one of the best dining experiences I had while I was in Israel. Though I was staying with my friend in Be'er Sheva (in the south, in the desert) she took a day off of work so we could travel back north together to Tel Aviv.